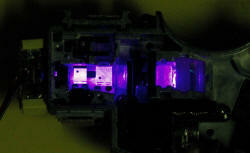 I have obtained a violet laser diode from a Blu-ray player. This is available new for US$40 (cost about AU$65 inc postage from eBay) as a replacement part (KES-400AAA) which includes the carriage and lots of complicated high tech optics. 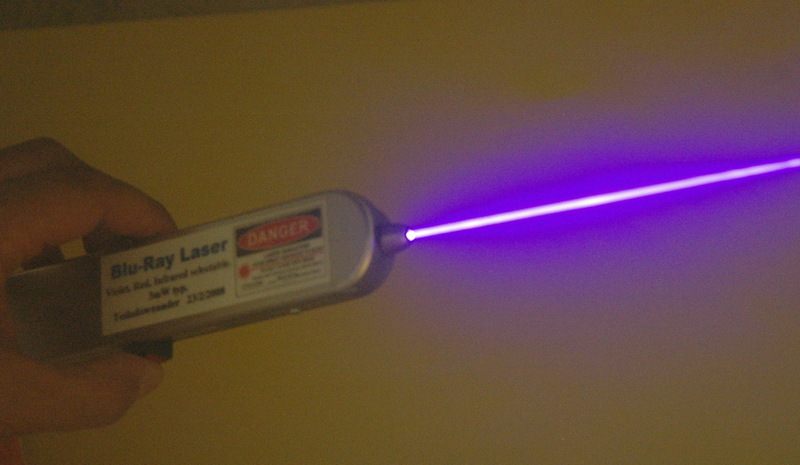 The violet laser also has red and infrared lasers in the same package. Remarkably cheap really. Plenty of eBay sellers for this if you search for the part number. 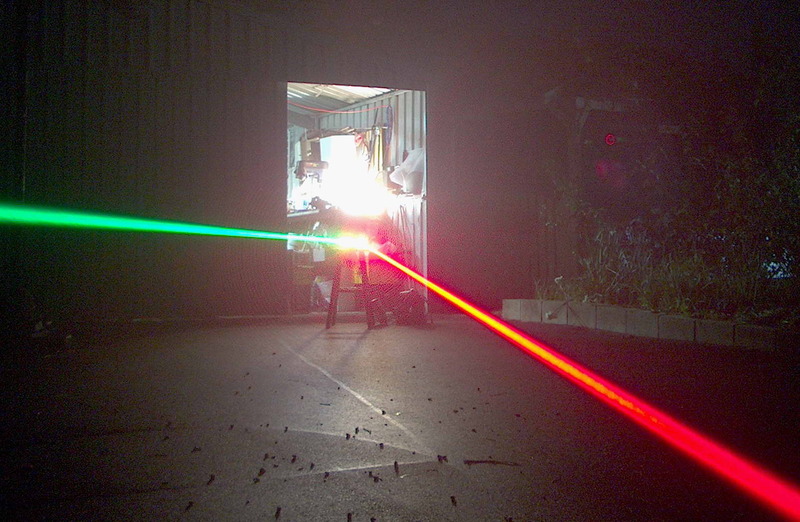 Leslie Wright (Plazmatron on 4HV) seems to be one of the early people to do this and has an excellent segment on his site in conjunction with Sam from SAM's laser FAQ. By and large I have followed his construction and used the same constant current supply. I first saw it on Mikes Electric stuff. 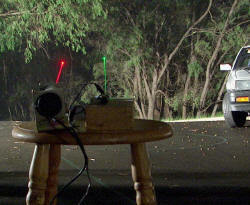 The left photo shows the beam in fog (from my fog machine), aiming up towards the camera. Short wavelengths scatter better (ie the sky is blue!). On a 2 second exposure it is enough to saturate the camera. 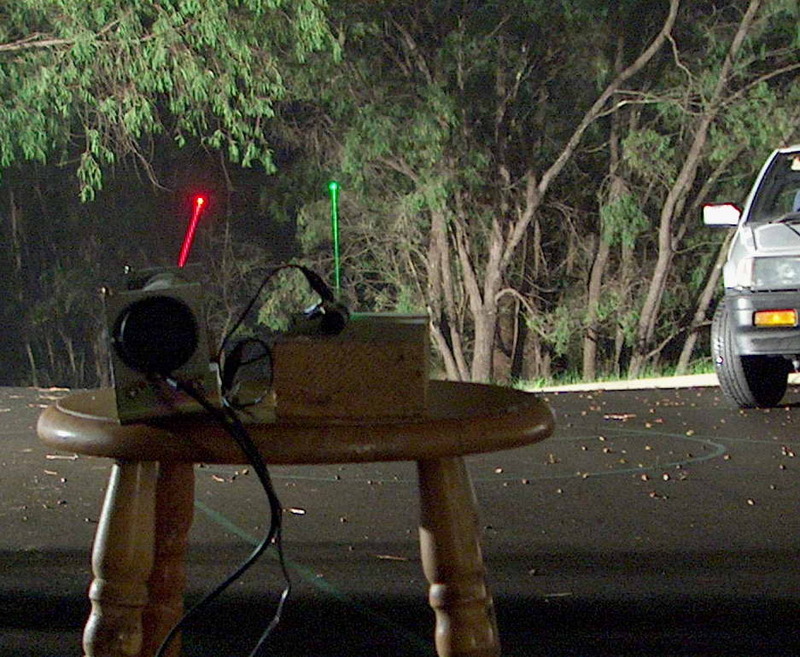 The right photo shows the beam hitting some cardboard. 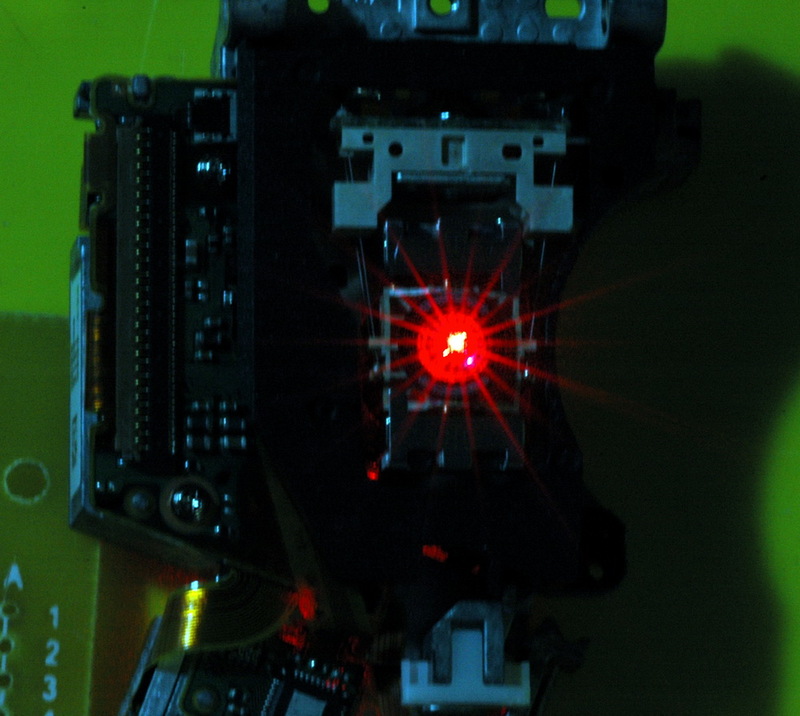 I took a lot of care to do the initial soldering of the laser while in circuit including the 0.1 uF cap across the diode (shorted and also the iron was earthed to the case). The flexible plastic circuit strip was cut and I removed other shorts and ran from low current with the described LM317LZ constant current supply starting with 10 mA. The red laser is speckled (i.e. lasing) and appears to be several mW. 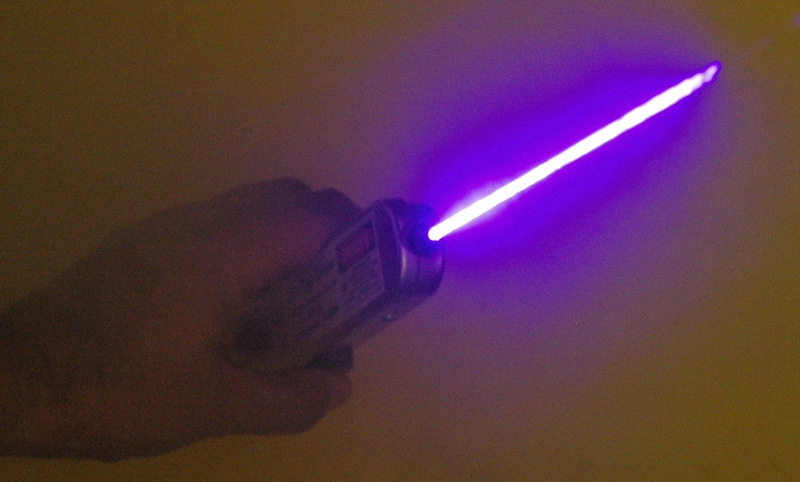 The violet laser, however was far less bright than the red one and less speckled. 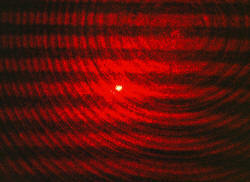 Part of this is due to the eye's reduced sensitivity at this wavelength. 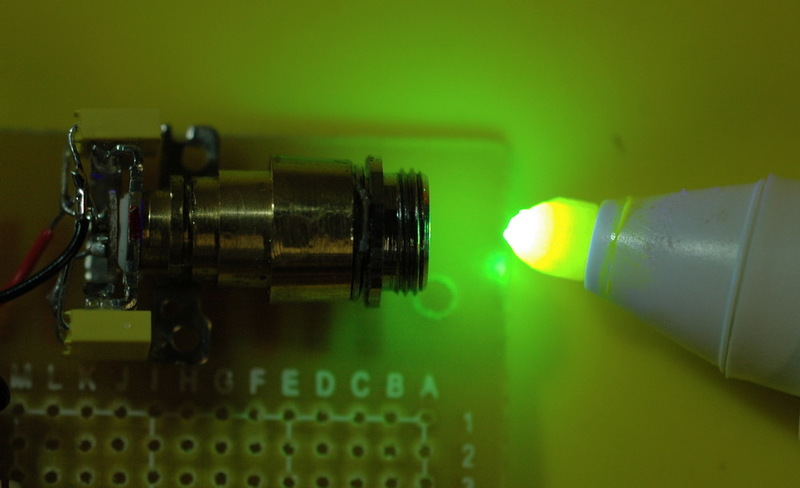 It still fluoresces things, particularly paper. Ith (threshold current) was about 26 mA judged by increased brightness but hard to be sure. 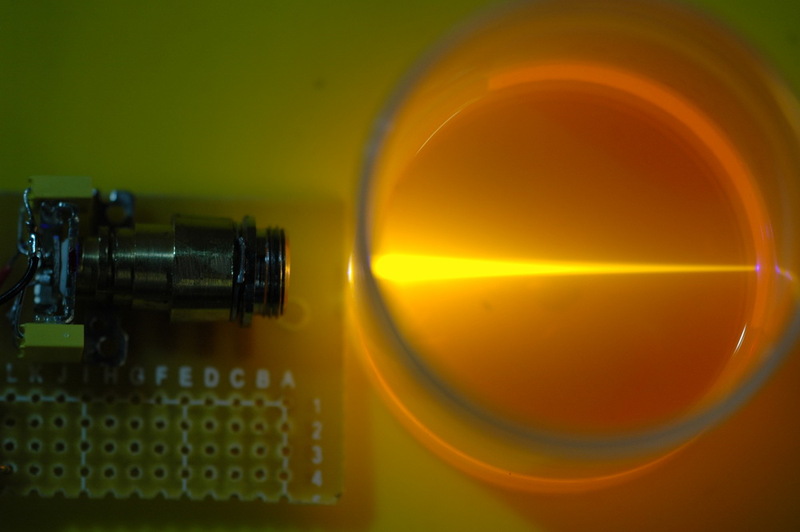 The unfocussed beam seems complete unlike the example of a damaged beam. I have run the current briefly (later up to a momentary peak of 79 mA without a change in beam). 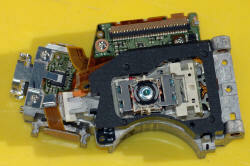 The left photo shows the optics side with cover removed. 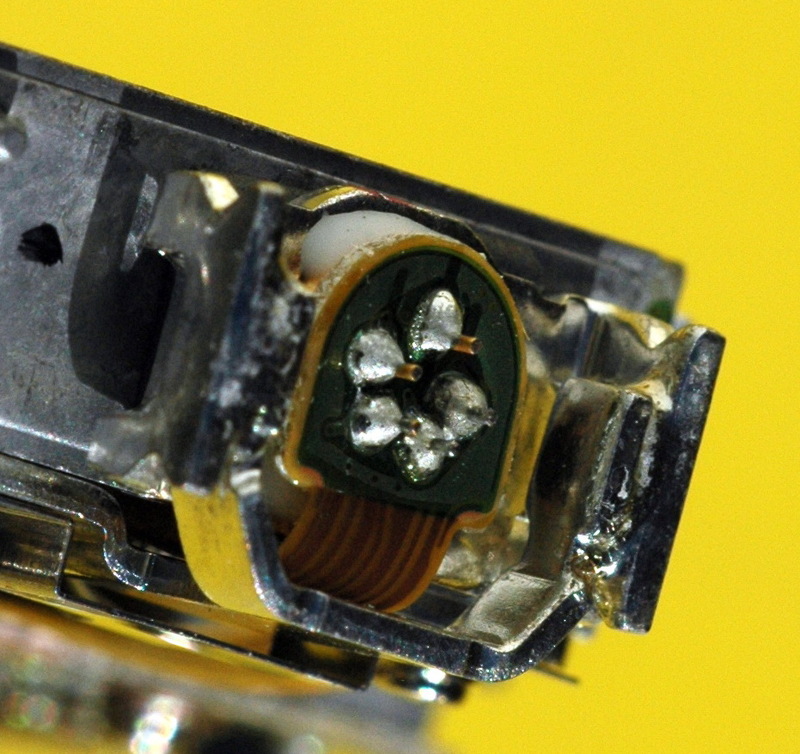 The laser diode is the small assembly at the extreme left with the red mark on it. 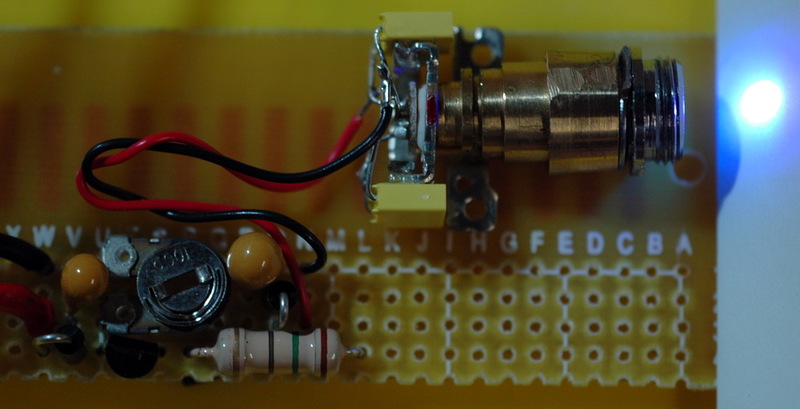 The center photo shows the other side with the objective lens and voice coil positioning. It is 7.5 cm (3 inches) across. 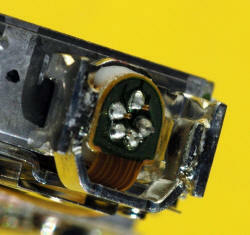 The right photo shows the 5 pins of the laser diode for the 3 lasers and photodiode. 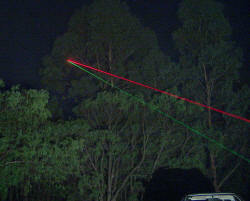 The left photo shows red laser turned on. 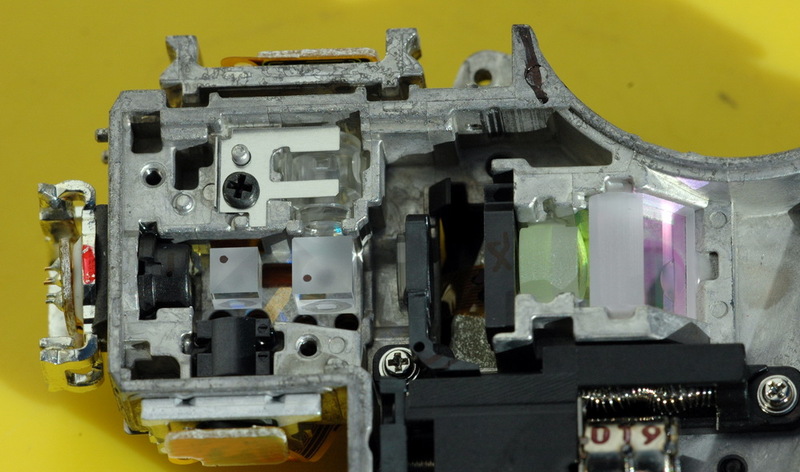 Note the yellow 0.1uF caps epoxied to the heat sink which I added to provide the electrostatic discharge (ESD) protection and a stable base for the wires to the driver. I eventually added three of these, one for each diode. The center photo shows red beam exiting the objective lens on the other side. 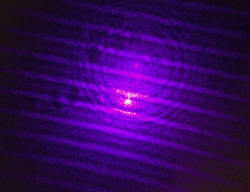 It is a complicated beam having passed through various diffraction gratings and lenses like Fresnel lenses. 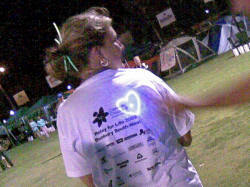 The right photo shows the beam projected through translucent plastic a few inches away. 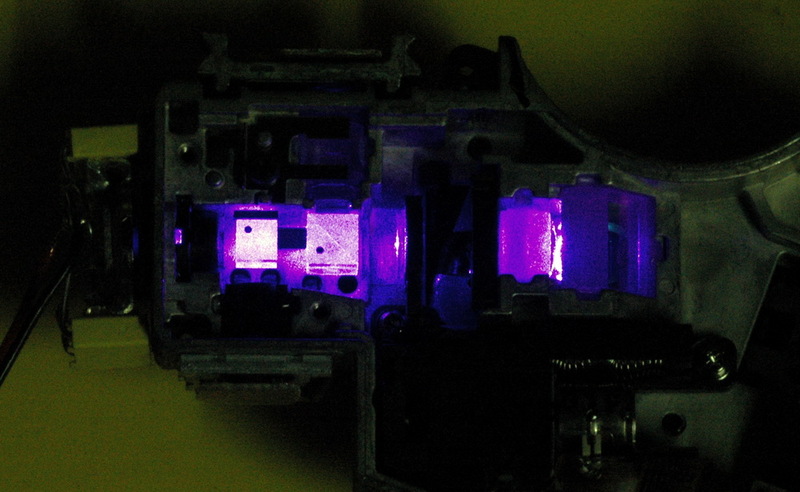 The left photo shows the violet laser lighting up the optics. 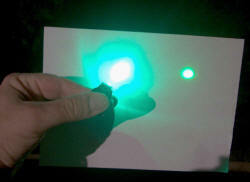 The center photo shows the diode projecting onto a piece of paper which is fluorescing. 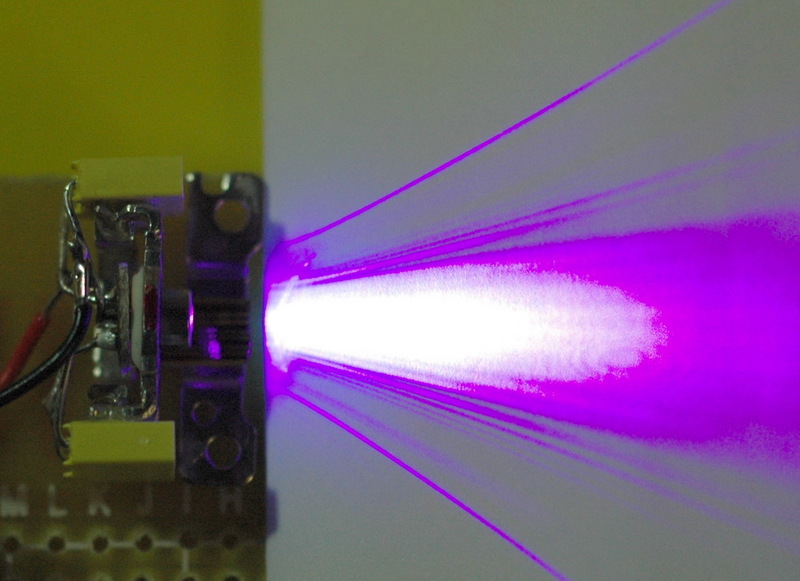 It is a very broad beam direct from the photodiode and not at all laser like. Safe to look at in this state only but not in the focused setup. The right photo shows the violet objective beam with the various lines and circles as with the red laser. 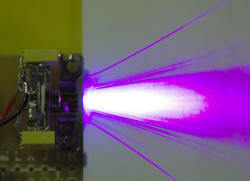 The left photo shows the constant current supply set at around 30mA and the violet laser collimated into a spot. 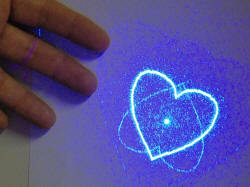 Here it shines onto paper and fluoresces a bright blue. The center photo shows it shining onto the tip of a fluorescent marker pen. 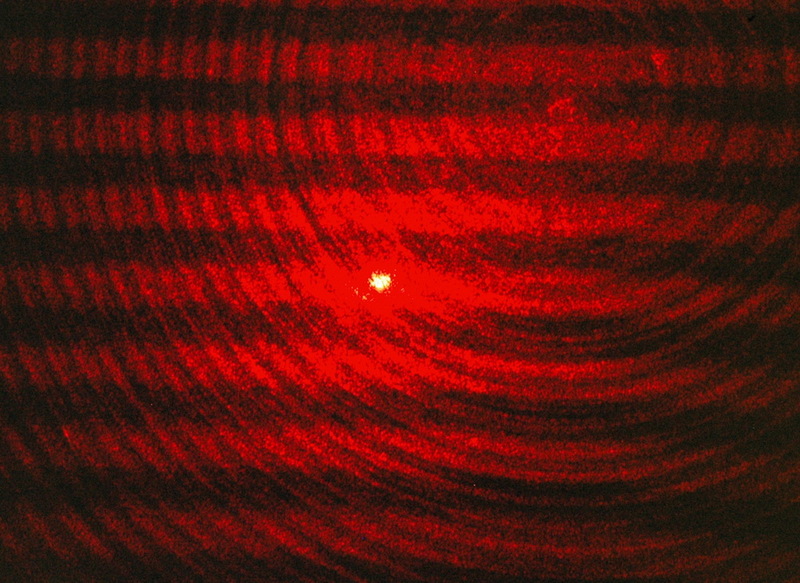 The right photo shows the beam through Rhodamine with intense orange fluorescence. 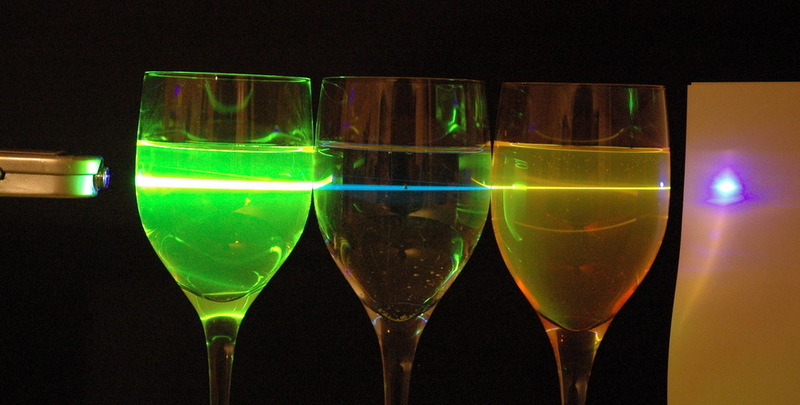 The photo above shows fluorescein, tonic water and rhodamine in glasses from left to right. 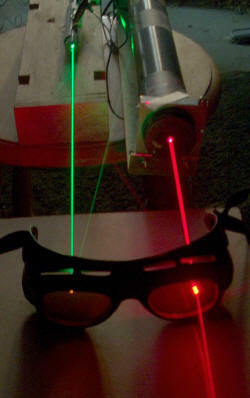 The left photo shows the laser made up in a metal case. Ironically it used to contain a pen/red laser pointer. 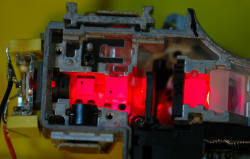 It shows the switch for selecting red/IR/violet. I wasn't really thinking because I should have had some low value resistors in the lines or some extra current shunting as I have damaged the red and possibly the IR diodes from over voltage or current. The right photo shows the laminated label. It is a nicely weighted comfortable unit. 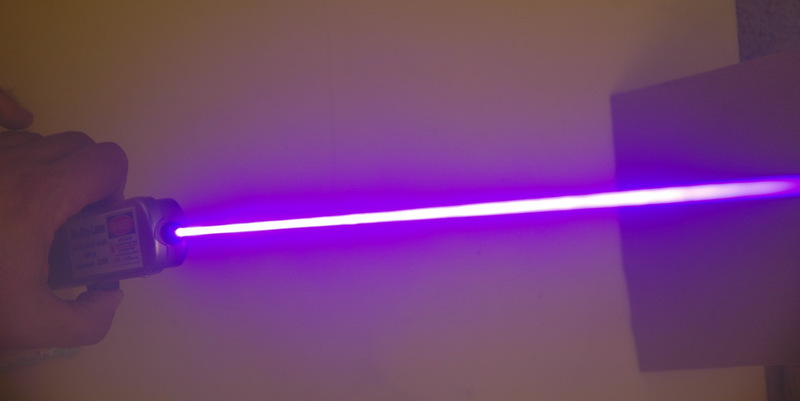 The left photo and center photos show saber like beam highlighted by fog. Pointing up to the camera the brightness is higher. The right photo shows the dog that was very interested in the dot (at first). 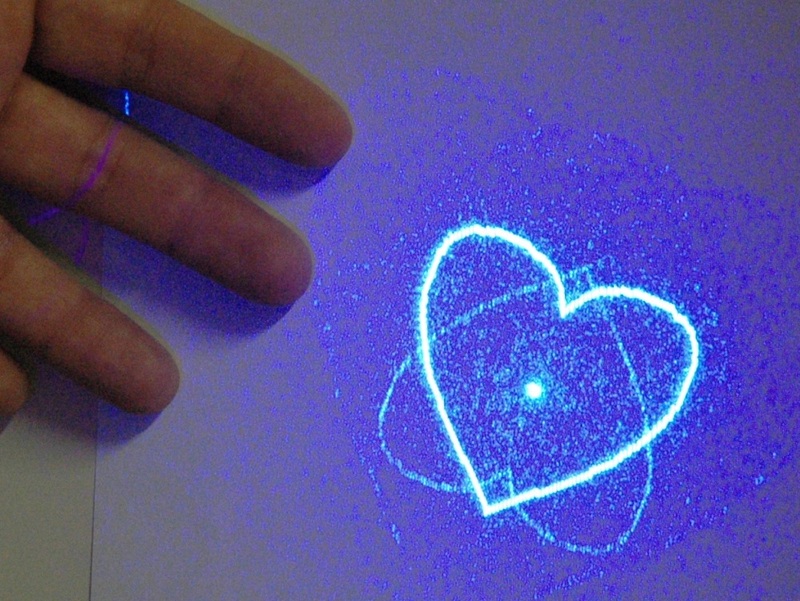 The left photo shows a heart shaped hologram (from a cheap laser pointer) showing the bright blue fluorescence from paper. 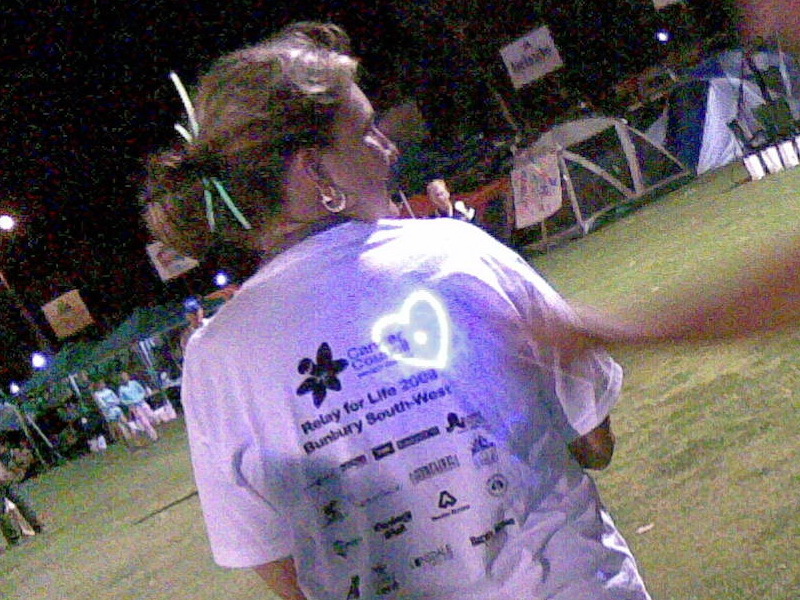 Center photo shows the heart hologram modeled by Mandy. Works great on white tee shirts and the hologram is low powered enough to be safe in public. 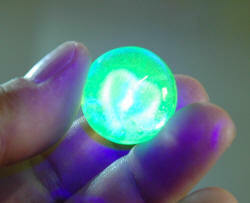 The right photo shows the same pattern through a uranium marble with bright green fluorescence. 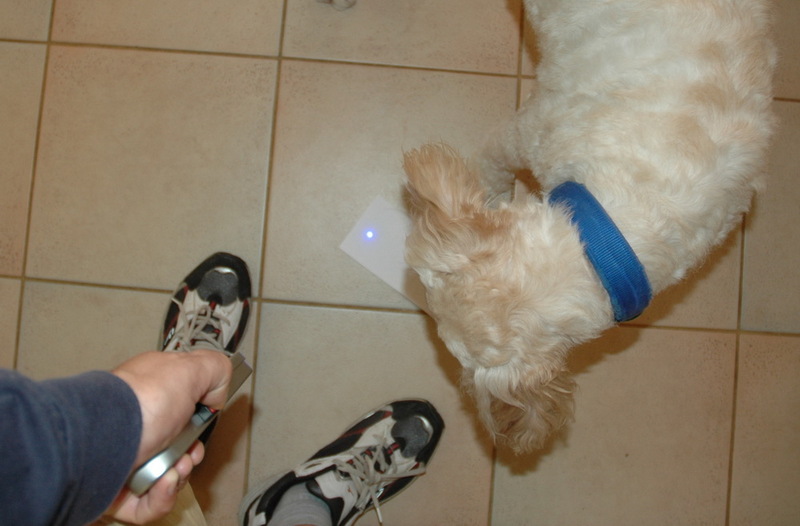 The left photo shows the highlighted by fog. 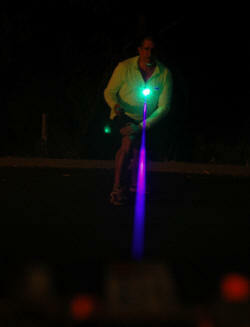 The right photo shows the beam against my fluoro cycling shirt with brilliant yellow green fluorescence. 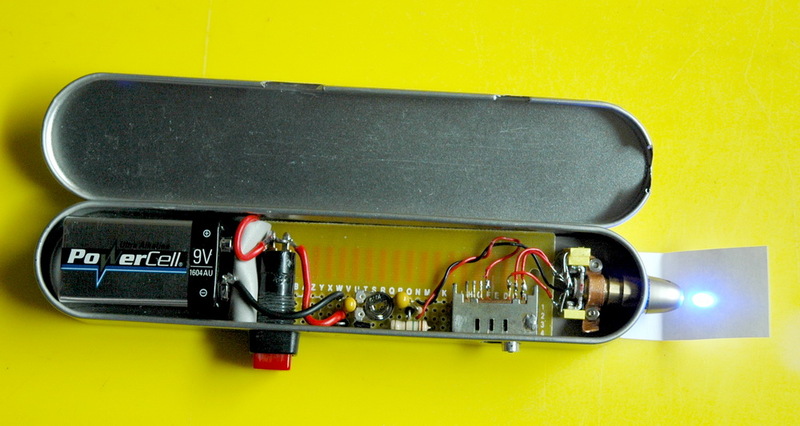 Green diode laser 5 mW 2004 The class IIIa 532nm 5 mW green diode module is lashed up in an old red laser pointer case that takes AAA batteries. Not fancy but effective and still gives me access to the power lines and switch. 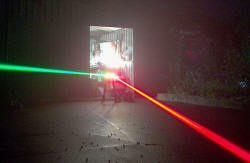 The light is 50 times as bright as a 1mW red laser pointer (5 times the power and green is 10 times the visual brightness of red). At a current of 400 mA the little AAA batteries are struggling to keep up the voltage much above 2.4 V and the brightness is reduced . For the shots below I have set my power supply to deliver 3.05 V and the head does get warm. The beam is visible in normal night air. 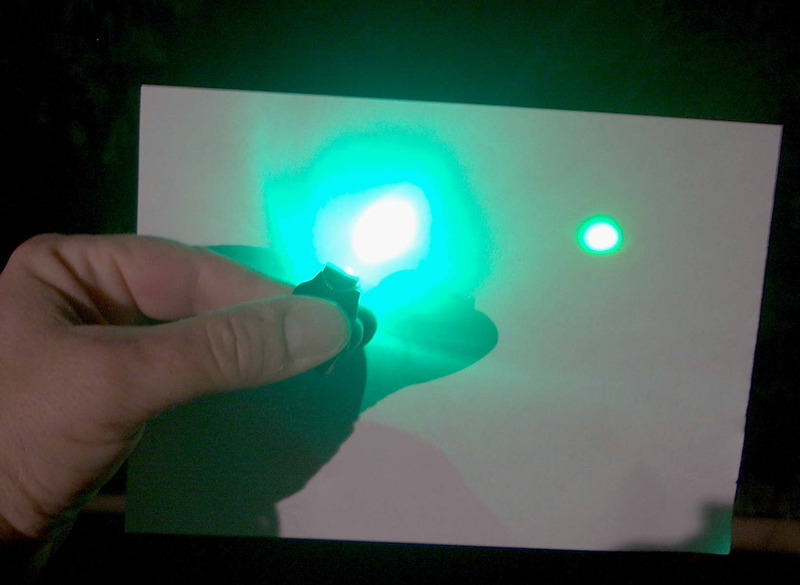 The photo on the right is a comparison of the green laser when it has diverged to about 1 cm compared with my green ring which is 14,000 mCd and seems much brighter. I had understood that the output of the LED was about 5 mW. This would suggest that the diode is underperforming. 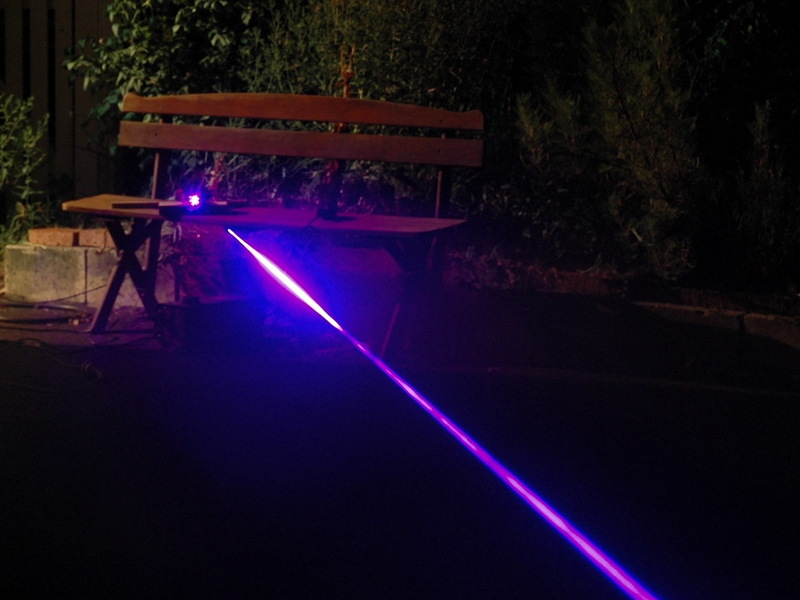 These photos were taken on a foggy night and compare the 5 mW green diode laser and the 10 mW red HeNe laser which interestingly seem of equal brightness to the eye as well as the camera. The first two photos are the same but taken from a different perspective and with different lighting. 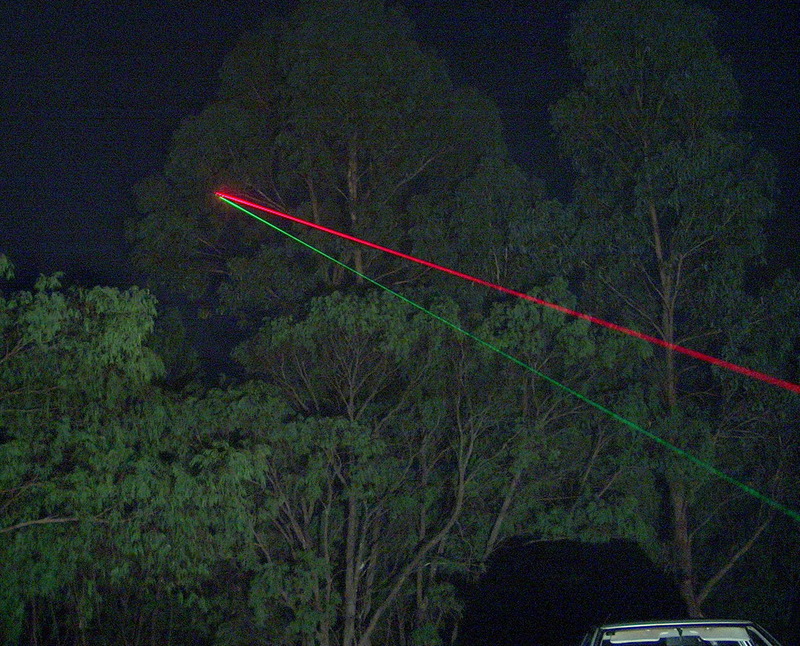 A shot through my green laser safety glasses to show the effectiveness for green (but not red). I would like to get a larger IR diode laser now that I have a little experience with the Blu-ray laser.